Let's celebrate vivo! 's 1st anniversary together! We'll have special & rare beers on tap! 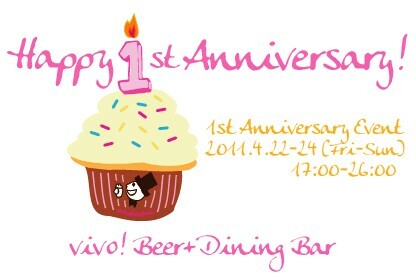 and specially designed 1st Anniversary Glass for you. Yahoo Brewing Indian Aooni(Blue Demon) Cask ver. Sankt Gallen XPA Grapefruit pickled ver. We thank you so much for your support ! and looking forward to seeing you at this event!